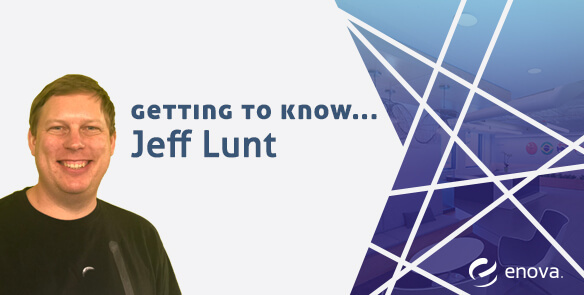 Meet Jeff Lunt - Senior Software Engineer II - Enova International, Inc. I collaborate most with Analytics and Underwriting Services. In fact, the product I work on, Enova Decisions, exists to highlight our company’s analytics expertise as a service. Underwriting Services is a partner in that effort — together we help build the execution engine and software plumbing necessary to make it all work. How have you taken advantage of Enova’s opportunities for growth (tech exchange, rotational program, mentorship program, conferences)? I had the opportunity to participate in the TechExchange in 2017, spending four weeks on the DevOps team learning about how our infrastructure is built, maintained and upgraded. It was an amazing opportunity to understand how different teams do their work and learn about the latest state of the art technology in another specialty. What’s your favorite space within the office and why? The kitchen is definitely my favorite space. It’s a great place where we all gather together to eat, celebrate and present new ideas. What do you enjoy about the work you do at Enova? Honestly, the best thing is the people. I love tech, but Enova is the first place I’ve worked where I go home at night and consistently look forward to going into the office the next day to work with my incredible team members. What was your favorite part about your onboarding program at Enova? Being an introvert, I was glad I was able to make fast friends with several people who were onboarding at the same time as me. The onboarding process is part learning experience — it’s self-paced so you can spend time focusing on what you personally need — and it’s part networking — I was able to spend a significant portion of my onboarding time getting to know people in the company, seeing what they worked on and learning what they were passionate about. At other companies, onboarding is often about getting you to be productive as quickly as possible, but those approaches often overlook the fact that working well with the team is actually the best productivity hack ever. Enova’s onboarding helps people get situated with the team from the get-go.